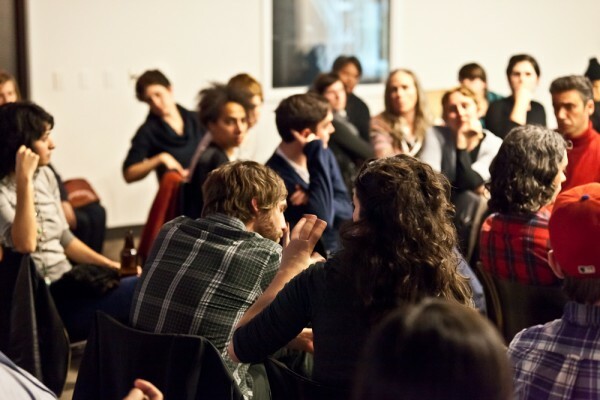 Below, curators Sharon Lerner and Xiaoyu Weng provide some thoughts on the “Riot Show” event, organized on December 2, 2010. Find the preview post here. 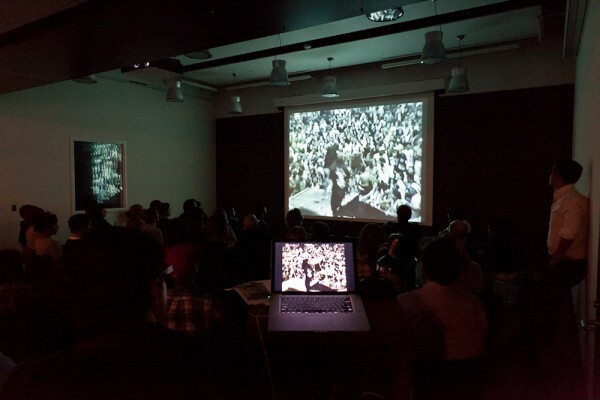 On December 2, Julian Myers and Joanna Szupinska presented, as part of Open Space Thursdays, “Riot Show,” Myers’s archive of recordings of crowd disruptions at rock concerts. Where before he’d presented these records as a kind of lecture, this time he staged a listening party and open conversation, bringing in a small group of friends (including us, Erica Levin, Tarek El Haik, and Fiamma Montezemolo) to comment, alongside the larger audience. He began by playing a few of the tapes, including an excerpt from Duke Ellington’s 1956 concert at Newport, a sort of predecessor of a riot situation in a mass concert; Public Image Limited’s bizarre 1981 audio-visual performance at the Ritz in New York; and the pièce de résistance of the evening, a video-recording of a riot of epic proportions at Guns N’ Roses’s 1991 show in St. Louis. Along the way the audience made some sharp observations and raised several questions. Among them were the overtly different natures of each riot situation, and the changing roles of recording technologies at live concerts. But a discussion about the political potential of riots prevailed — in particular the dynamics at play for dispossessed working-class audiences, when a spectacular event does not meet their expectations. 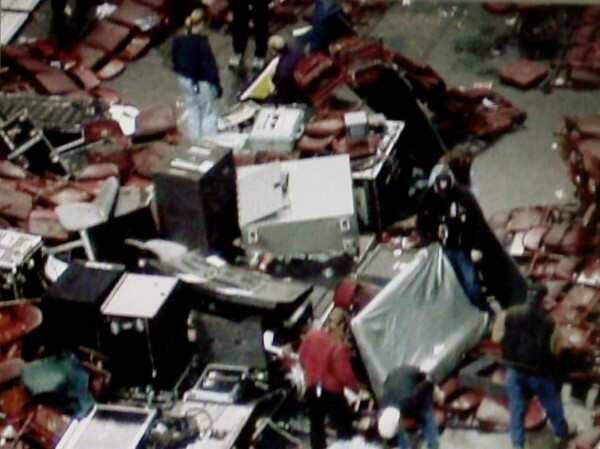 In that sense, the St. Louis riot was not only a straightforward retaliation to the band’s onstage meltdown and conflict with the crowd, but also, as Anne Walsh noted, a successful attempt to mount an alternate spectacle, aimed symbolically to compensate for the absent satisfaction. However, the question remained: were the actions a conscious negation of the system or merely an ambivalent anger led by carnival sensation? And ultimately, can we find a redemptive potential in this ambiguity? As Julian has pointed out, in his essay and in the event itself, there are many entryways to his archive. It does not conform to any given typology, and perhaps actively resists categorization. However, it certainly offers many things for discussion — including a couple that were sidelined in favor of the political discussion. For example, one interesting feature of the archive is its emphasis on the culture of bootlegs, as well as its aesthetic of Xeroxed, rundown, bit-crushed, fragmented, and abstracted visual material — an aesthetic that resonates with the landscape of chaos and debris after the riots themselves. What lies behind this formal fascination? Far from being an empty visual form, this aesthetic is specific to both an historical moment and a form of social exchange. The emphasis on the bootleg points towards a DIY mode of production, and directly involves issues of distribution and accessibility. The aesthetic registers this mode of exchange, an alternative economy that resists various attempts to commodify or mystify these events by the recording companies and others. We’re particularly interested in how this aesthetic of fan culture and trading might translate into other contexts and historical moments. Originally peer-to-peer sharing was underground, and accessible only to a small group of people. Now, through the expansion of the Internet, bootlegging appears as a mode of resistance to censorship (as it is in contemporary China, for example), as a direct reaction to economic constraints, or simply as means of informal exchange subtending the market. Against the presumed clarity of a crisp, high-definition world, where every single event can be scrutinized to the point of exhaustion, the coarse quality of these recordings — and the alienation and distance that they promote — seems to exacerbate the ambiguity of what was recorded at the time, or at least to reopen these events we think we already know to further debate. I do not for a moment challenge the importance of understanding, through discussion, the political dimensions of riot. There is quite a large historiography of crowds, riots, public events, including not least the behavior of audiences in Elizabethan theater and Italian operatic performances, and there is also the work of such people as Elias Canetti who was interested in the connections between crowd behavior (both riotous and disciplined) and the growth of German fascism in the 1920s and 30s. However, this rather chaotic ‘Open Space’ seemed to want to base its discussion of such matters on one clip as though it were somehow an uncompromised piece of evidence. It pleases me politically that people want to talk about resistance and rebellion, but we did not have in Julian Myers’ rather self-congratulatory presentation anything like enough to go on – so the chaos continued. The question of bootlegging is also an interesting one – as is the question of why people want to take a cellphone photo of the Golden Gate Bridge when there are plenty of great postcards available; and the question of what is being filmed and by whom – in this respect it is interesting to compare the Guns/Roses clip with coverage of Bruce Springsteen’s concerts whose audiences are remarkably similar. I was pleased that I heard the discussion but disappointed that I did not learn as much as I had hoped about the way technology, including the accessibility of the kit for bootlegging and observation, has altered our perception of live events. Thanks for sharing your thoughts. I only wish you had had a chance to bring up some of these points during the conversation. Indeed, there was a lot to say. As Julian has recently published an essay on the subject (http://fillip.ca/content/riot-show-some-notes-on-the-archive) (in which he does call up the ideas of Canetti, among others), and has presented several formal and informal lectures in the past, we definitively felt another such event would not be as compelling as an open conversation. Happily, our five invited discussants, as well as members of the audience, took up the task of thinking about the clips he played, and leading the conversation down various paths. That there are many other clips we could have watched – not excluding Springsteen, as you suggest – is undeniable; while each of these recordings carries with it its own specificities, they also share common qualities. I wanted to respond to some of the points you’ve raised. I am of course interested in some of the sources you name, alongside, say, the investigations of Jeffrey Schnapp and the Stanford Humanities Lab on such matters. That, for instance, Canetti did not come up explicitly, does not mean that he wasn’t on people’s mind. I do refer to him in my essay, as Joanna notes above. Elizabethan theater does have a place in the archive too. The archive’s focus, however, dwells primarily on crowd politics after the development of the modern amplifier, alongside portable recording devices, for obvious reasons. And you don’t mark out, in your comment, exactly how you imagine Canetti’s anthropology of fascism should be measured against these interruptions in a modern consumer culture (through the loudspeaker, perhaps), or in relation to the particular situations and history I’ve marked out. As for your description of the event as ‘rather chaotic’: I assure you that Joanna and I meant to produce an event that was not strictly academic, that made room for people to engage at different levels, and that produced an active dialogue. This, I think, is in tune with the ambition of the Open Space events as they were put to me, precisely to be “open” and not a panel of experts. On these terms, I was happy with how the evening played out. Certainly a more traditional format could have produced a different sort of conversation and knowledge. But that’s not what we pursued this time. I assure you that we considered the event down to the last detail, and that there was no ‘chaos’ there— whatsoever. As for your suggestion of Springsteen, perhaps you can point to the recordings you have on your mind. I haven’t seen them. The presentation, as Sharon and Xiaoyu mention above, was of three recordings, not one, and I don’t see that G N’ R was presented as ‘uncompromised.’ I can only say that I regret you didn’t bring your thoughts to bear during the forty minute discussion, where they might have been tested against other opinions and ideas, instead of launching your missiles from the safe and rather diminished cover of the comments box. I wanted to ask about a place where we seem to disagree, or at least have different takes on the material. Above you say that the quality of the recordings exacerbates their ambiguity. I say something different in the essay, that the recordings serve as a kind of primary material, which allows the audience to build counter-narratives more in tune with what actually happened. So, I wonder about the value you both see in things being ambiguous—or if somehow we can have our cake and eat it too. Julian, thank you for bringing up the question of “ambiguity.” I think it is most important that we all agreed with the possible “counter” or “alternative” narratives that the audience are able to build when reviewing these materials. And the “ambiguous” quality further facilitates the happening of these narratives by abstracting some absolute facts. We pointed out that the ambiguity is closely related to the quality of the sound/image. The coarse texture (against the presumed clarity of a crisp high-definition) endows the material a sense of the archival and thus further alienates the moment of the riot. The material, as you quoted in your essay of Retort’s Afflicted Powers is “a way of deliberately alienating the moment, of putting the non-lived, the non-significant, at a distance” in order to “take the ownership of the passing moment” and to make it endurable and valuable. I think this might also partially answer Mr. Bradbury’s question (in the post above) about the “cellphone Golden Gate Bridge photo” as the photo taker has the impulse to “own” the moment not just the postcards. The “ambiguity” applies mainly to the quality of the visual material per se (Xiaoyu already elaborated on this), its coarse quality et cetera. I mean, the definition and the look of it allows for more than a little bit of space for interpretation (and perhaps projection…? )…What is happening there? Who originated this? Usually in these materials there is tons of missing information and the narrative is not weaved or tight together. It is for sure not a cohesive discourse that is being produced but rather a narrative absolutely dependent on its constructed mythic counterpart… By this I mean that a weird recording of the Guns & Roses riot would not generate half the interest had it not been embedded with the band’s spectacular aura already. I agree with you that it is the pointing out towards the fissures in the construction what seems interesting. Again, as you say they are “somewhat closer to the real events and work against the mythic grain,” however they are far from being a definite or clear either. As primary material, they are fragile, partial and as instable as the moments of instability they love to point towards. This, to say the least, should be considered as a positive thing, since at this point who wants a clear cut, unidirectional version on how things are supposed to be or look like? Well put, Sharon. I think I understand now what you meant by “ambiguity”—the lack of detail or overarching narrative semblance in these recordings. As you say, aren’t these aspects also partially what attracts Julian to the riot shows? Although such riotous actions might be common at concerts, one could not build a collection unless the events had not been recorded. It is not only the occurrence of riot, then, but the recording of it that is of interest. Julian himself has re-photographed low resolution digital files and video stills, indulging his “aesthetic affection,” as he writes in his essay, “for the layers upon layers of mediation-schmutz that overlay the artifacts gathered from these rather obscure networks.” In a gesture that updates this Richard Princesque practice with the unmistakable qualities of contemporary media, Julian simply photographs his laptop screen. Whereas Prince’s pristine photographs betray the imperfect printing and color of mass-produced magazine pages, Julian’s photographs capture the pixilation and blur of the infinitely reproduced and resized jpgs of the web.